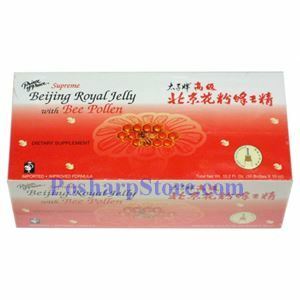 This herbal oral drink is is a blend of fresh Beijing Royal Jelly and Bee Pollen with with the traditional low heat process to preserve the natural precious components. Royal Jelly is the main source of food for the queen bee which has a life span of 30-40 times longer than the worker bees. Bee Pollen is another natural substance discovered in recent years. It contains no less than 22 amino acids, 27 minerals, biotin, natural enzymes, coenzymes and hormones.